Carboflow Cartridges - D. I. Engineering Co. Ltd.
Carboflow granular activated carbon cartridges contain a broad band adsorbent (typically 250g/10" length). The major application for these elements is the removal of chlorine, taste and odour from process water and organics removal in process liquids. Elements are constructed to provide compatibility with a wide variety of liquids and gases. When required the carbon can be impregnated with silver to reduce bacterial build up. Radial flow elements consist of a bed of high grade activated carbon sandwiched between porous inner and outer sleeves which help prevent carbon migration. In the end flow version, the outer sleeve is porous only at the bottom. This forces the liquid to flow through the entire carbon bed (typically 350g/10 inch length) to exit at the top. This results in the maximum contact time between liquid and carbon. 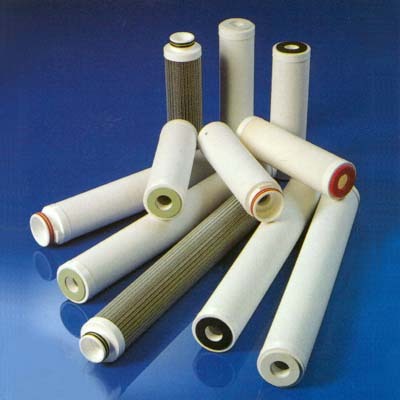 For domestic water applications the carbon cloth element offers both filtration down to 5 micron as well as removing chlorine. Carboflow shells can be filled with ion exchange resins for use in ultra pure water systems and for precious metals recovery from plating solutions. For optimum life and performance we would recommend a maximum flow rate of 10 litres/minute for the radial flow cartridge and 5 litre/minute for the end flow and cloth versions.